The great Eldar revamp continues. It was slow again at work this weekend so I spent some time fixing up my Vypers and started work on my Wraithlord (will have him done soon). 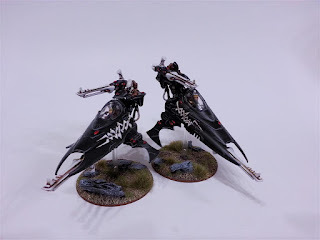 Below I have a pic of the original Vyper that was painted up for my old Ulthwe Strike Force list (it was BS 4 and had a crystal targeting matrix, hence the bright lance). 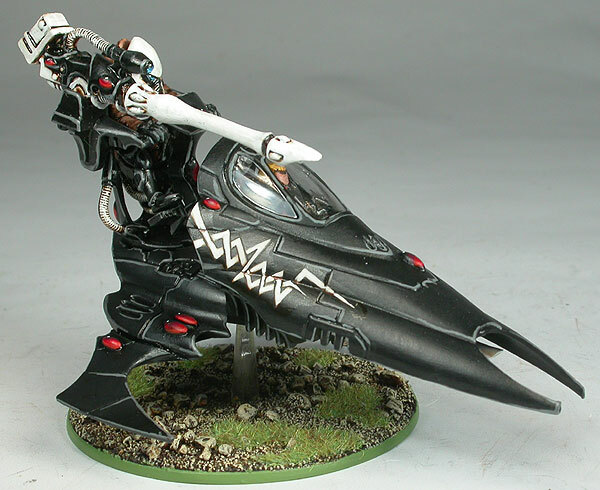 And here are the two Jetbikes with an added underslung Shuriken Cannon and new style Cannon for the turret as well as the new flying bases. Up Next: A full army shot of the Necrons and I will also be talking about my experiences with the army so far!